I love this one! O.K - I love all of them but this one makes me really wish I could do the digital thing. This kit is AMAZING Ro!!! I HAVE to get it!!!! Its times like these I wish I had a credit card! Love your work girl and I'm loveng the photos! So sharp and clear!!! 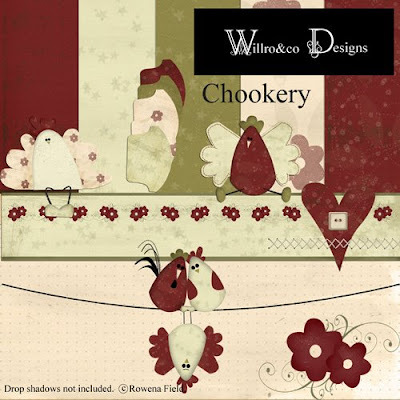 This is a fabulous kit, I really love the colours and those cute chickens. Love the look of this kit - almost makes me want to scrap digitally! (almost!). Gee....Nice chooks! To come up with a design like that. Just gorgeous as usual. 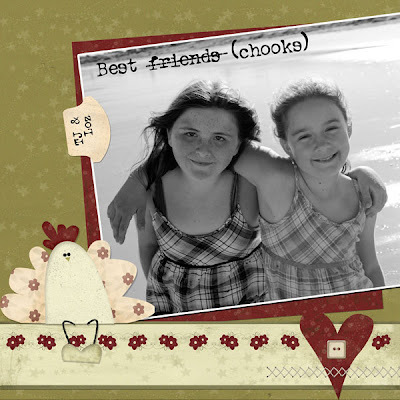 They actually remind me of some chooks a great friend did for me but in America Folk Art style! Hmmmm that scroll saw doesnt see the light of day since scrapping came to town! This is so cute, love the country feel to this kit.